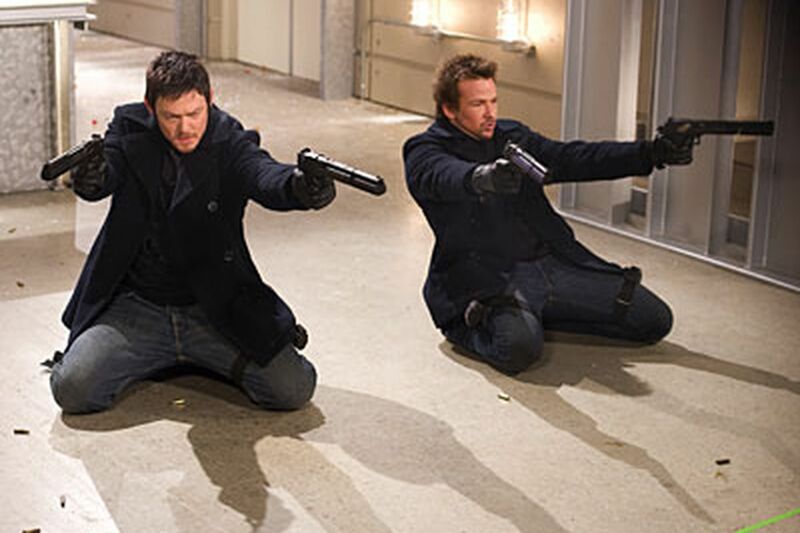 Norman Reedus, left, and Sean Patrick Flanery star in "The Boondock Saints II: All Saints Day." The original "Boondock Saints" built its following on DVD - talked up from teen to teen as the movie that Hollywood and other grown-ups did not want you to see. The movie was goofy, politically incorrect and violent - its release was sandwiched between the Columbine school massacre and 9/11 terrorism attacks, during a temporary dialing down of movie violence. And of course it didn't help that the movie's writer-director-bartender-madman, Troy Duffy, offended nearly everyone in Hollywood who might have helped distribute the movie. Now, Duffy and his shoot-em-up, crack-em-up movie are back, but with some disadvantages. "The Boondock Saints II: All Saints Day" is the movie that Hollywood desperately wants you to see, and it's a franchise, the most corporate word in the studio lexicon. The basic ingredients, though, are there, and so is the cast: Sean Patrick Flanery and Norman Reedus return as Connor and Murphy MacManus, two Irish brothers from Boston who like to fight, drink, pray and kill members of organized crime in super slow-motion while sliding across a floor. The sequel finds them lying low in Ireland, but they return with Da (Billy Connelly) and a Mexican sidekick (Clifton Collins) to rid Boston of the mobsters who've again asserted control of the city. Duffy has been denigrated as a second-rate Quentin Tarantino wannabe, but there is a unique tone to his movies - he shares Tarantino's affinity for Asian-style cinematic violence, but strained through a colander of lowbrow '80s comedy - John Woo meets "Porky's." The movies have a very strange sense of humor, and even some legitimate creative flourishes. Duffy, for instance, builds tension around a planned assassination, then skips over the event itself and jumps directly to the crime-scene aftermath. There, investigators reconstruct events and Duffy uses flashbacks to show how the murders went comically awry. All signs at the end of "All Saints Day" point to a "Boondock Saints Three," and why not, in a world that makes room for "Smokin' Aces 2," "American Pie Presents Band Camp" and "Bring It On Again"?